The special connection Tech N9ne shares with his fans is something that can’t be measured in album or ticket sales. It transcends anything else in the music industry. 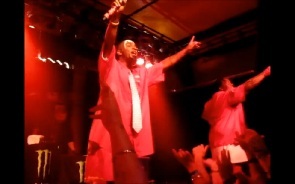 Fans in Edmonton, Alberta, Canada found out just how much Tech N9ne loves his fans when they joined him in a giant sing-along that ran through some of his biggest hits. Giving his real fans a bit of a test, Tech would begin singing and signal the crowd to finish the lyrics. The crowd proved to be full of the realest Tech fans, as they showed their dedication by singing “Dysfunctional”, “Blown Away”, and “Leave Me Alone”. The ritualistic test of his fans has become a staple of Tech N9ne’s live shows, and it continues to make an impact on everyone in attendance. What do you think it means to be a real fan?